1991 – 1992 – First creations of climbing shoes for personal use and entourage. 1993 – 1994 – Creation of the Andrea Boldrini brand. Launch of 3 models Andrea Boldrini with a technical form (plunging and respect the width of the foot) having more than 5 years of technological advance on the brands like Boreal (leader of the market) with the model Laser, Vector and Ninja. The Sportiva was on models such as Kendo. 1995 – 1998 – The range is expanding as well as the search for “local” shops. Sold mainly during sports events converting the fans of 5/10. 1999 – 2003 – Renewal and creation of new models, the activity remained marginal until 2002. Slippers were sold in direct sale to the consumer and by some French specialty stores. The catchment area therefore remained very local. Some models already featured the technology without edges and rubbers in tension. 2003 – 2007 – Launch of a brand new range with Andrea Boldrini with more innovations to prove our know-how in the medium (mono scratch clamping system in Z). Andrea Boldrini’s aim is to create a strong identity with all the products of one and the same color: YELLOW. A true visual recognition, a brand identity. production problem and then transferred to new larger premises at Bourg de Péage (26). In 2006, launch of a new innovative pad (Air pad) with patented system and SALAMANDRA, Shoe for approach and work walk; pure concentrate of technology and know-how Andrea Boldrini. External microfiber rod Lorica Sporter waterproof against water aggressions while allowing the foot to breathe. An elastic tongue completely covering the instep to avoid and limit penetrations of pebbles and dust. Vibram Spider outsole with excellent off-road performance, (artificial and pointed surface for climbing and loading on rocks). The lack of funding did not allow it to go into production. 2008 – 2009 – Two new innovative and revolutionary concepts. F.C.S. (Full Contact Sole) sole worked on form, removing the traditional edge, allowing permanent contact. 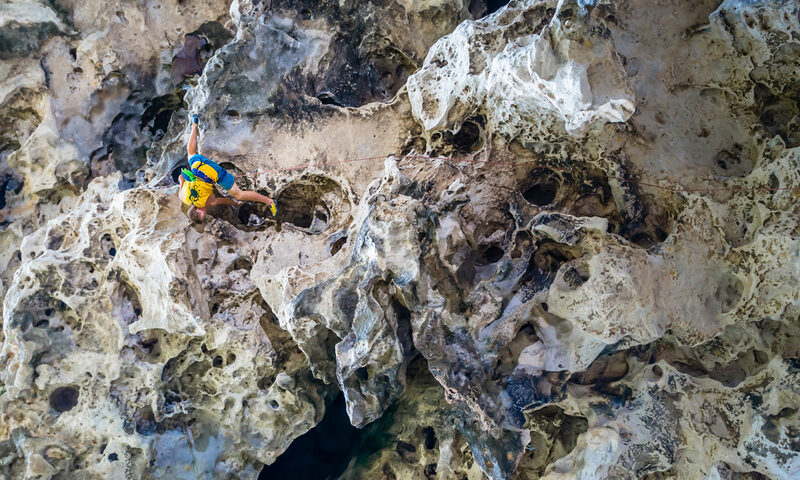 All new sensations, a new concept that will revolutionize the practice of climbing. This new concept of “FCS” sole offers many advantages, compared to a traditional edge sole; precision and stiffness of the edge while having a good central sensitivity, edge that follows the deformation of the liner during the supports, absence of deformation of the edge (bearing of the angle eraser) during microloads, increase of angle d the fact that the liner rolls and pivots on the socket while a traditional edge tends to unhook at an excessively large angle change, increased longevity due to a larger area of ​​use. New climbing shoe Andrea Boldrini: APACHE TALISMAN, High-tech footwear, offering a great versatility of use and users thanks to a perfect and homogenous footwear due to its new structure combined with the mastery of the materials used. An elastic tongue composed of an elastane / foam / Licra complex comes to maintain the foot like an elastic ballerina while accentuating the comfort and the breathability of the foot. The Lorica 100% micro-fiber rod prevents stretching of the boot after use and ensures comfort as soon as it first passes. A side gum and heel, designed with a new formula including aluminum particles, thus improving elongation and lightness, thus reducing the thickness. In 2008, the launch of the models APACHE TALISMAN AND APACHE 5. These models are placed on a segment without equivalence; materials used, advanced technologies, design, use and technical advantages. In 2009, the financial crisis forced Andrea Boldrini to develop an intermediate range, the APACHE LIGHT, THE PANTERA LIGHT. 2011 – 2013 – Creation and launch of a new PUMA climbing boot. New design of the already existing climbing shoes: THE TIGER AND THE TIGER EVO, for a more technical oriented technique with an unmatched comfort.